Isaiah Chapter 22:15-25 Star Chart: Clockwise from Shebna who "hewed out a sepulchre here ... in a rock" (Orion hewed out the solar cavern opening) (22:16) till "the LORD will carry thee away with a mighty captivity, and will surely cover thee (black lunar mask on Sagittarius) (22:17) is 203° days. Yes, "in that day (in that same day which is a year in prophecy), saith the LORD of hosts, shall the nail that is fastened in the sure place (polar star is only place in northern zodiac that doesn't rotate) be (red radius sword) removed (Shebna's lunar head and outer red radius line), and be (red radius sword) cut down, and fall (Sagittarius rotates down); and the (lunar head) burden that was upon it shall be (red radius sword) cut off (Shebna's lunar head) (22:25) and be turned and tossed "like a lunar ball ... and there the chariots of thy glory (Auriga with a sun wheel) shall be the (red radius line) shame of thy lord's house (Auriga and Orion)(22:18). 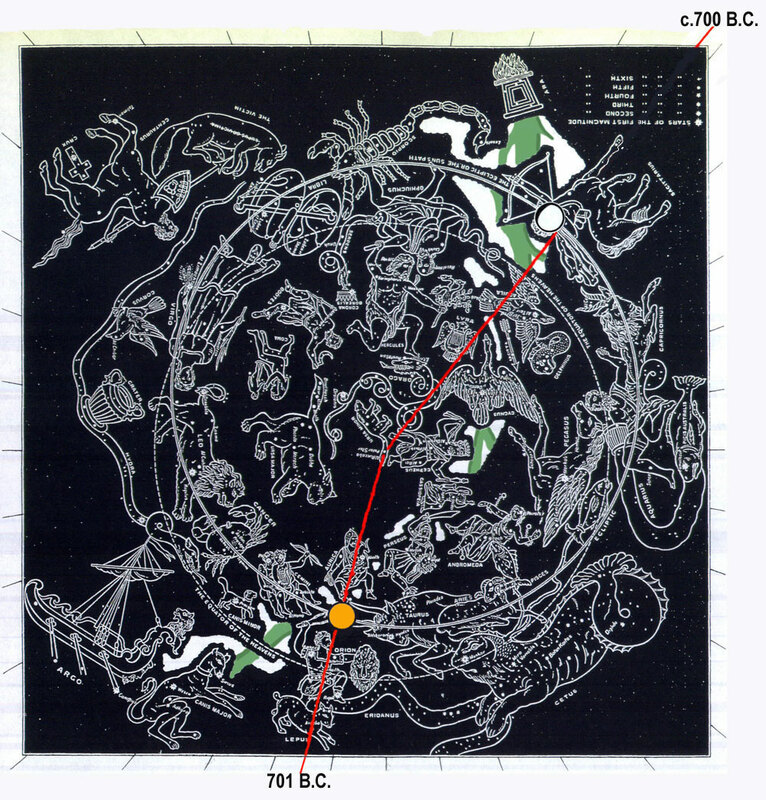 Since Sagittarius is a picture-prophecy of both Shebna's death and Eliakim's promotion, only a very brief time span could elapse between 701 B.C. and the Sagittarius dual fulfillment. Therefore we have chosen 203° days clockwise to arrive at Shebna's beheading and Eliakim's promotion. In the fourteenth year of Hezekiah (701 B.C. ), it was not Shebna, but Eliakim, "who was over the house" (Isaiah 36:3,22; 37:2). By the time of Rabshakeh's arrival at Jerusalem as Sennacherib's envoy (Isaiah 36:2-4), Shebna had lost his post as prefect of the palace. The Jews say, "He kept up a traitorous correspondence with the king of Assyria, and was in treaty with him to deliver the city into his hands." He was taken prisoner and carried away even without an Assyrian captivity of the nation generally. Jews say that Shebna was tied to the tails of horses by the enemy, to whom he had designed to betray Jerusalem, as they thought he was mocking them; and so he died. The Jews say he was brought to a very shameful end; they say that when he went out of the city of Jerusalem, in order to deliver Hezekiah's forces into the hands of the enemy, Gabriel shut the gate before his army; to whom the enemy said, where's thy army? he replied, they are turned back. They said, thou hast mocked us: upon which they bored his heels, and fastened him to the tails of horses, and drew him upon thorns and briers. So, says Kimchi, instead of chariots of glory he thought they would give him, they put him to shame, binding him to the tails of horses. 16 What hast thou here? and whom hast thou here, that thou hast hewed thee out a sepulchre here (Orion hews out the solar cavern opening), as he that heweth him out a sepulchre on high, and that graveth an habitation for himself in a rock? 2. What kindred or relations? For the Jews say he was a stranger by birth; which is the more probable, because his pedigree is not mentioned in any of those places of Scripture where he is named. and whom hast thou here? of thy family and kindred; what ancestors hast thou? where did they live or die, and were buried? what children hast thou to succeed thee in honour and estate? or what relations to be interred, when deceased, in thy grave, that thou hast made such a provision as follows? and it may be observed, that wherever he is spoken of, the name of his father is never mentioned. 17 Behold, the LORD will carry thee away with a mighty captivity, and will surely cover thee (black lunar mask on Sagittarius). an allusion to the ancient custom of covering the faces of condemned persons; of which see Esther 7:8. Compare Job 9:24 Ezekiel 12:6,12. The Rabbins gather from hence that Shebna was struck with leprosy, because the leper was obliged to put a covering upon his upper lip; and this sense is embraced by Grotius; but the allusion seems to be to persons in disgrace, or condemned to die, whose faces used to be covered, Esther 7:8. 18 He will surely violently turn and toss thee like a (lunar) ball into a large (rotating Zodiac) country: there shalt thou die, and there the chariots of thy glory (Auriga with a sun wheel) shall be the (red radius line) shame of thy lord's house. Violently turn and toss—literally, "whirling He will whirl thee," that is, He will, without intermission, whirl thee [Maurer]. "He will whirl thee round and round, and (then) cast thee away," as a stone in a sling is first whirled round repeatedly, before the string is let go [Lowth]. chariots … shall be the shame of thy lord's house—rather, "thy splendid chariots shall be there, O thou disgrace of thy lord's house" [Noyes]; "chariots of thy glory" mean "thy magnificent chariots." It is not meant that he would have these in a distant land, as he had in Jerusalem, but that he would be borne thither in ignominy instead of in his magnificent chariots. The Jews say that he was tied to the tails of horses by the enemy, to whom he had designed to betray Jerusalem, as they thought he was mocking them; and so he died. Jarchi says Casiphia (e), a place mentioned in Ezra 8:17. Aben Ezra interprets it of Babylon, which seems likely. shall be the shame of thy lord's house; as if the chariots and coaches of state he had rode in were to the reproach of the king his master; who had made such an ill choice of a steward of his house, or prime minister of state, and had advanced such a worthless creature to such a dignity; but it may be better supplied thus, without being so strictly connected with the other clause, and which is more agreeable to the accents, "O thou, the shame of thy lord's house" (f); a disgrace and dishonour to Ahaz, who perhaps put him in his office; and to Hezekiah, that continued him in it. The Jews say he was brought to a very shameful end; they say (g), that when he went out of the city of Jerusalem, in order to deliver Hezekiah's forces into the hands of the enemy, Gabriel shut the gate before his army; to whom the enemy said, where's thy army? he replied, they are turned back; say they, thou hast mocked us: upon which they bored his heels, and fastened him to the tails of horses, and drew him upon thorns and briers. So says Kimchi, instead of chariots of glory, he thought they would give him, they put him to shame, binding him to the tails of horses. On the other hand, tzânaph, which is applied in other instances to the twisting of a turban, also signifies to wrap up, make up into a bundle, or coil up. And caddu¯r, like tzene¯phâh, signifies that into which Shebna would be coiled up; for the Caph is not to be taken in a comparative sense, since the use of caddu¯r in the sense of globus or sphaera is established by the Talmud (see at Job 15:24), whereas the Arabic daur only means gyrus, periodus. Shebna is made into a round coil, or ball, which is hurled into a land stretching out on both sides, i.e., over the broad surface of Mesopotamia, where he flies on farther and farther, without meeting with any obstacle whatever. 19 And I will drive thee from thy (Zodiac) station, and from thy state shall he (red radius line) pull thee down (Sagittarius upside down). the Jews say, "He kept up a traitorous correspondence with the king of Assyria, and was in treaty with him to deliver the city into his hands." However this was, it should seem that he was a foreigner (for we never read of the name of his father) and that he was an enemy to the true interests of Judah and Jerusalem: it is probable that he was first preferred by Ahaz. Hezekiah was himself an excellent prince; but the best masters cannot always be sure of good servants. The full accomplishment of this prophecy is nowhere declared to us. We merely find that, by the time of Rabshakeh's arrival at Jerusalem as Sennacherib's envoy (Isaiah 36:2-4), Shebna had lost his post as prefect of the palace, and filled the lower position of scribe or secretary. He may, however, have been subsequently further degraded, and thereupon he may have fled to Egypt, as Jeroboam did (1 Kings 11:40). he did not seek great things for himself, nor did he thrust himself into the office, but the Lord called him to it in his providence, and put him into it; he did, as Kimchi observes, put it into the heart of Hezekiah to appoint him governor in the room of Shebna. This man was a type of Christ; his name agrees with him which signifies, "my God will raise up"; that is, the dead by him, 1 Corinthians 6:14 and so does the character of a servant, frequently given to Christ in this book; see Isaiah 42:1 nor did Christ take any office to himself, but was called unto it by his Father, Hebrews 5:4. 21 And I will clothe him with thy robe (white Milky Way), and strengthen him with thy girdle, and I will (red radius line) commit thy government into his hand: and he shall be a father to the inhabitants of Jerusalem, and to the house of Judah. 22 And the (red radius line that zig-zags into the black crescent) key of the house of David will I lay upon his shoulder (the gibbous-moon shoulder); so he shall open, and none shall shut; and he shall shut, and none shall open. 23 And I will fasten him as a (red radius line) nail in a sure place (Polar Star is only stationary point in the northern Zodiac); and he shall be for a glorious throne (Cepheus) to his father's house. In a sure place; in the strong walls, or solid timber, in the house; which is opposed to Shebna’s instability, signified by a ball, Isaiah 22:18. 24 And they shall hang upon him all the glory of his father's house (gibbous moon), the offspring and the issue, all vessels of small quantity, from the vessels of cups, even to all the vessels of flagons (gibbous moon) (the entire Zodiac turns on the Polar Star nail). In the typical sense, it is to be understood of the vessels of mercy; some of which are larger, and others lesser; some capable of receiving more grace and larger gifts, and others less; to whom Christ communicates, and whom he fills, according to their capacities; all whose wants he supplies, and whose persons he supports; he fills them with his grace, and he fits them for glory; see Romans 9:23. 25In that day (in that same day which is a year in prophecy), saith the LORD of hosts, shall the nail that is fastened in the sure place be removed (Shebna), and be cut down, and fall (Sagittarius rotates down); and the burden that was upon it shall be (red radius line) cut off (Shebna's lunar head cut off): for the LORD hath spoken it. in the fourteenth year of Hezekiah it was not Shebna, but Eliakim, "who was over the house" (Isaiah 36:3, Isaiah 36:22; Isaiah 37:2). But Shebna also filled another office of importance, namely that of so¯pher. Was he really taken prisoner and carried away (a thing which is perfectly conceivable even without an Assyrian captivity of the nation generally)?